On Saturday and Sunday of this event, I brought my face paint supplies and had a blast painting "temporary tattoos" to all the children who attended. I met so many amazing artists and was inspired in so many ways that motivates me to better my skills in this field. Before I started facepainting, I was pulled aside by the Virginian Pilot and asked about my head tattoo. They were doing a piece on the reasons behind peoples tattoos. I was featured along with many other artists and tattoo lovers in this article below. To see the original link, click here. Chase Nolan, from South Florida, has a heart on his right hand that represents his son and an eye on his left that is based on something his brother doodled. Photographed at the Hampton Roads Tattoo Festival on March 3, 2017. Brooke Lister, Norfolk. "I had skin cancer ... stage 2 melanoma in 2011 and they did the surgery to take it out in 2012. They had to dig a lot of muscle out at the bicep. I had a big scar and it was depressing when people asked me about it. So I got a tattoo to cover it up, a cocoon and a butterfly to show rebirth." Photographed at the Hampton Roads Tattoo Festival on March 3, 2017. Jenna Stephens, Richmond, has customized her prosthesis to match her tattoos by using a laminated t-shirt. Photographed on March 3, 2017, at the Hampton Roads Tattoo Festival. Athena Karn, Norfolk. Her husband is local artist Sean Karn, who tattooed Lady Liberty on her neck as a visual reminder that she stands for all us. Photographed at the Hampton Roads Tattoo Festival on March 3, 2017. Adam Czerniak, Portsmouth, has a tattoo on his lower leg that is a based on a video game. His girlfriend has a matching one. Photographed on March 3, 2017, at the Hampton Roads Tattoo Festival. Mike Chagallo, San Antonio, TX. His body is a homage to his Mayan ancestors and he was one of many artists at the Hampton Roads Tattoo Festival on March 3, 2017. Cecilia Patterson, Virginia Beach, has a rose and the words "Just Let Me Go" tattooed on her head as a tribute to her late grandmother. "My grandmother flat-lined in the hospital and they brought her back. When she woke up she asked them what they were doing and she said ‘Just Let Me Go.’ And she loved pink roses. She was such an important part of my life." Photographed at the Hampton Roads Tattoo Festival on March 3, 2017. A man known as "The Enigma" is seen at the Hampton Roads Tattoo Festival taking place Saturday and Sunday at the Hampton Roads Convention Center in Hampton. She show runs from 11 a.m. to midnight today and from 11 a.m. to 8 p.m. Sunday. The festival features music, live shows and lots of ink. It costs $25 to get in. Mike Cann, Norfolk, had this tattoo done in Thailand on his honeymoon. It is a Tai spirit, and was done by dipping a sharp bamboo stick into ink and poking it into the skin by hand. Photographed at the Hampton Roads Tattoo Festival on March 3, 2017. Tattoos are like life’s journals. Some people write about their path in books, and others have their story inked into their skin for all to see. 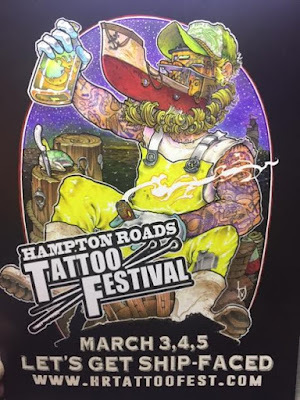 At last weekend’s Hampton Roads Tattoo Festival in Hampton, there were thousands of stories to witness and some new ones being transcribed into the body’s canvas. Organizer John Cann says the event was a reunion of sorts. “I think of this event as a macro culture with lots of subcultures,” he said at the start of the seventh annual festival. “You have bikers, musicians, artists ... all kind of groups that have the same thing in common with body art and the culture that surrounds it. Nearly 10,000 people walked the floors of the three-day event – one of a dozen held around the world the same weekend – getting tattoos or watching others get one. There were tattoo industry booths offering up supplies and lots of vendors selling various types of art and body jewelry.